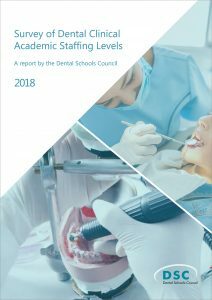 In positive news for UK dentistry, the new Dental Schools Council survey of clinical academic staffing levels shows that numbers of dental clinical academics appear to be recovering after a period of decline. The survey reveals an evolving team with a sharper focus on teaching. However, the survey also highlights concerns that the capacity of these staff to focus their resources on research may be diminishing over time. Clinical academics combine teaching and research with clinical practice, carrying their experience from each aspect of their work into the others. This makes them a driving force for innovation in teaching and treatments, and skilled practitioners for patients.Their recent rise in numbers is part of an overall trend which has seen them increase by 24.8% since the survey began in 2000. The preceding period of decline and instability between 2010 and 2015 had been highlighted to funders and employers by previous iterations of this survey. This year’s data hopefully represents a turning point and a rejuvenation of this important team. The survey makes the recommendation that the work of inspirational dental clinical academics should be used to highlight their benefit to both patient care and government policy. This is exemplified by the influential work of Professor Jimmy Steele, who in 2009 led the independent review of NHS dental services in England. The recommendations in his report continue to have a strong impact on the direction of government policy, including helping to set the direction for the ongoing contract reforms. Professor Steele’s wide-reaching recommendations have helped to improve patient care and will continue to do so as we look to the future of dental healthcare. A source of concern raised in the survey is the difficulties in recruiting to vacancies, particularly in research-active roles at the Lecturer and Senior Lecturer (or Reader) levels, across the majority of specialties in the survey. Further research is required to understand how to address this. ‘While the rate of increase has been changeable over the years, dental schools can be very proud of the work they have done to bring the numbers of dental clinical academics back to a strong level. This is of significant benefit to the quality of dental care in the UK. ‘At the same time, more needs to be done to highlight the champions of clinical academic dentistry, particularly their important research which drives innovation in dental care. This is why the work of Professor Steele is raised as an excellent example of how clinical academia can impact not just research and education but policy-making at the highest levels. ‘We must hold up the role-models such as these to encourage other gifted clinical academic dentists to make contributions to the future of dentistry, as well as to make clear how important dentistry is within broader clinical academia and its key role in public health. The Dental Schools Council is the authoritative voice of the dental schools within universities across the United Kingdom and Ireland. This publication, Survey of Dental Clinical Academic Staffing Levels 2017, includes data from UK dental schools only. This is the fifteenth data update to be published by the Dental Schools Council since 2000. 18 dental schools returned data on clinical academic grade, specialty, percentage full-time, source of funding, age, gender and ethnicity for each individual in post on 31 July 2016.
for public health academics, holds an honorary contract with a nominated body i.e. Public Health England or a local authority. For more information on this press release please contact: Edward Knight, Senior Communications Officer, on 020 7419 5427. For further information about the work of the Dental Schools Council please see www.dentalschoolscouncil.ac.uk.